There’s nothing like growing your own fruits or vegetables. The feeling of starting them off as the tiniest seed and watching them bloom, blossom, and bud into something beautiful. 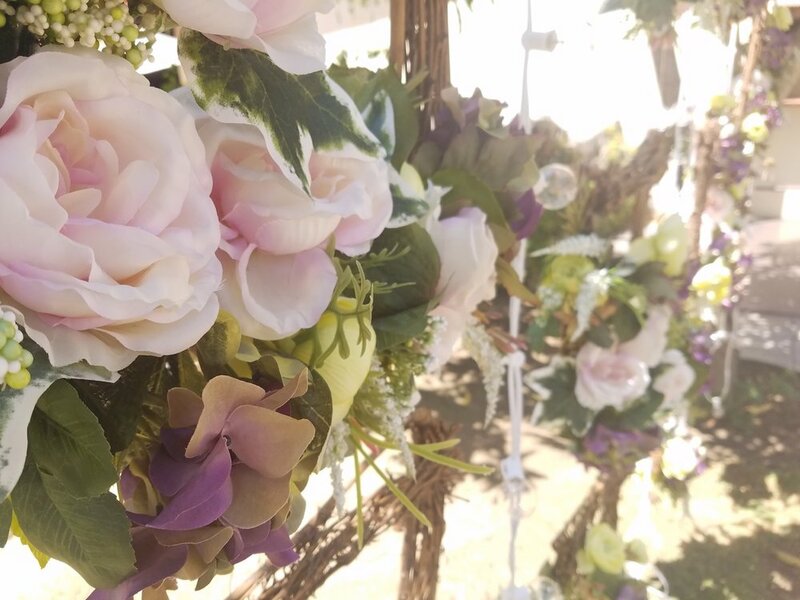 Flora Farms, just outside of San Jose, is just that. It went from being a desolate dessert into something so beautiful and so full of life. I had Flora Farms on my list of things to do for very long time and today I finally made the trip there. We made a noon reservation, which I highly recommend doing because it gets very busy. The second we stepped out of the car, we were immersed into a lush oasis. 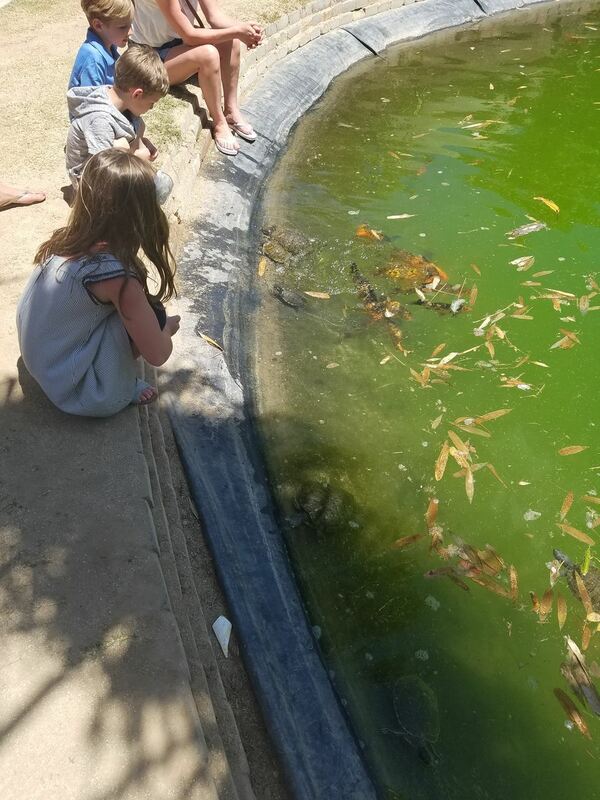 Bumble bees buzzed around sunflowers and children laughed as they fed the turtles and koi fish in the pond. There was life and beauty everywhere we looked. We were seated at a quaint table for too, overlooking a garden full of spinach, lavender, rosemary, and sweet basil. As started our lunch of with a fresh pressed beet, kale, green apple, ginger, and cucumber juice, an old black lab with a peppered snout came to join us for lunch, partly, we think, because we had such a lovely spot, but the other part, most likely, to escape the four screaming children. We had every intention, to prolong our lunch for as long as possible. 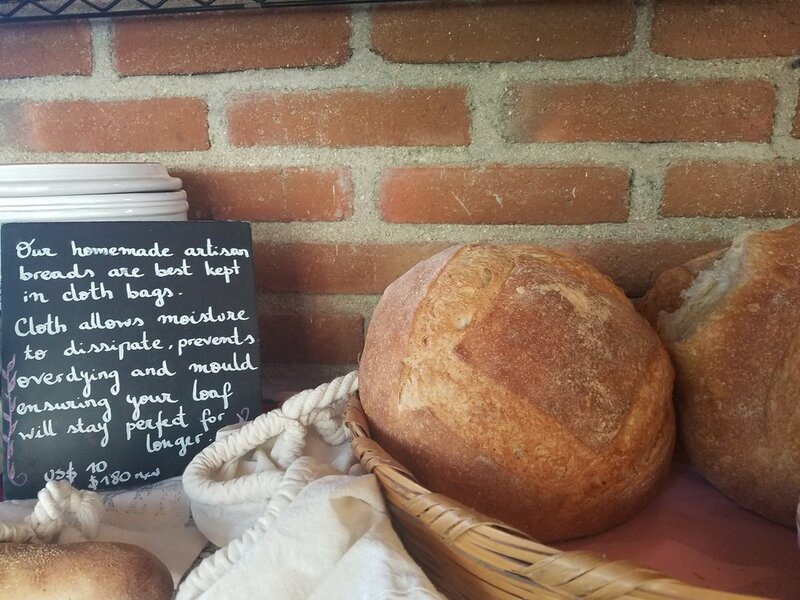 So as we slowly sipped our fresh juice and nibbled on some sumptuous freshly baked bread, we ordered a white bean and pumpkin seed dip that came with flat bread, crispy Guanciale, and a garlic roti. We were torn between that and the chilled cucumber and almond soup with lemon cream. First course down and it was time for some cocktails. I opted for the lavender vodka martini and my boyfriend got the smokey mezcal hibiscus margarita. I’m not a big a fan of mezcal, tequila’s smokier flavored cousin, but if you enjoy a good mezcal then he highly recommends it. Flora Farm’s cocktails were exactly how craft cocktails should be. They were the art child of a skilled mixologist. There was even a mystery cocktail that I never figured out the name of. It looked like an elaborate version of a Bloody Mary but it was a gorgeously looking meal in itself that was overflowing with citrus and vegetables. Finally, we were peckish enough to order some lunch. The decision wasn’t easy and there was definitely more than one internal debate on what to order. They had a tantalizing array of brick oven pizzas like the pizza fresca with house lemon ricotta and freshly picked thyme or the thinly sliced potato, rosemary, cage free farm egg pizza, and clouds of fresh mozzarella. But today, was a day for fresh veggies and the ratatouille vegetable sandwich is exactly was I was looking for. It was stuffed with roasted eggplant, bell peppers, almonds, tomatoes, and lathered with a chile ancho spread with a side of farm fresh greens. My boyfriend singled out the catch of the day, which was red snapper that came with an array of seasonal vegetables like purple cauliflower and carrots and was topped off with corn vinaigrette and arugula. His was definitely the more flavorful of the two, but they ratatouille sandwich was nothing to scoff at. Every single meal that came out of the kitchen looked delectable. At Flora Farms, the greens are greener, the fruits are sweeter, and the meat is juicier. One of my favorite things about Flora Farms was how they raised their animals. They all roam free, without hormones or antibiotics and fed purslane, amaranth, and even fresh mangoes in the summer. With our bellies full, we took a walk around the property. On the edge of the restaurant is a little market with beautiful arrays of fresh vegetables and a little bakery with devilish sweets like homemade éclairs, cinnamon rolls, and pecan sticky buns. It’s a perfect place to bring the family, or come alone and sit by the pond with your favorite novel. There are even a few local artesian shops on the property just in case you need to kill some time before your reservation. Spending the day at Flora Farms was everything I hoped it would be and more. The atmosphere of the restaurant is as light and airy as freshly baked nut bread and you can’t help but smile at the bouquets of sunflowers patiently waiting at each table. Nestled deep in the Mexican desert, lays a little ranch just waiting to be discovered. Everything here is just as it should be: simple. The small huts are brick with thatched roofs; the furniture is nothing more than a compilation of branches—sturdy and plain. On the bed is a thick wool Mexican blanket, for the cool desert nights and on the night stands are single candles—not for decoration. There is no electricity at the ranch so at night, and everything is done by candle light. 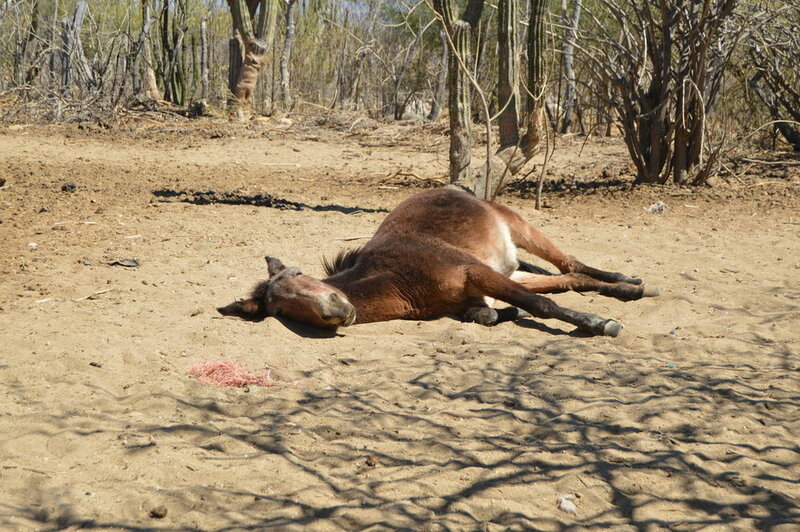 Donkeys and goats roam the ranch and are playfully harassed by the xolos, Mexican hairless dogs that sit with you by the fire, hoping for a nibble of food. You will have two brick huts to yourself, one with the bedroom and bathroom and the other is the kitchen area. In the kitchen hut is a sink, a table, and a two burner gas stove top. We didn’t use the stop top once. We came with heavy black skillets instead, prepared to cook our meals over an open flame. Crack open a couple of farm fresh eggs and watch the cheese in your morning quesadillas bubble over as your mouth waters. At Ranch Ecologico, simple is better. There’s no drip coffee or espresso machine, only a kettle for hot water, dehydrated coffee and evaporated milk and strangely enough, on a chilly dessert morning it has never tasted so good. After a filling breakfast, a small hike is just what we needed. The arid desert opened up into a beautiful oasis: Santiago Falls. A waterfall leading into a pool of emerald colored water that fed life to the tiny fish darted around my toes and the bird that sat on the boulders quenching their thirst. For those brave souls, climb to the top of the waterfall and immerse yourself into the crisp, cold water below. 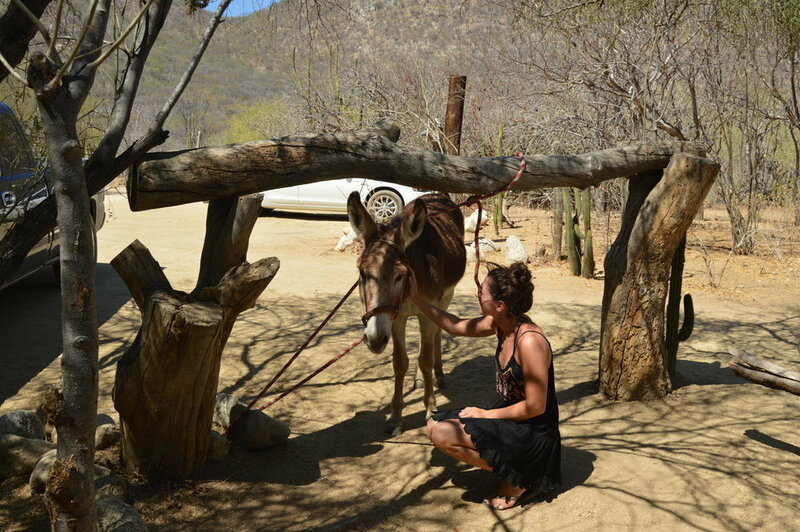 After dinner, walk to the ranch and spend the sunset hours petting the donkeys and goats. Then head up to the roof top and star gaze at the desert sky. The ranch at Santiago Falls is about escaping. There’s no Wi-Fi or computers, there isn’t even a proper stove. Spend a few days and enjoy the untouched beauty of a Mexican desert—goats and all. Mexico City was the last and final leg of our three week trip around Mexico. We were tired, in desperate need of doing some laundry, and had a very bad case of Montezuma’s revenge. But that didn’t stop us from experiencing every little thing we could in the historical Mexico City. When I pictured celebrating Day of the Dead in Mexico, I pictured the opening scene from Spectre, with elaborately dressed skeletons dancing through the city streets and floats hovering about and I couldn’t wait to be sucked into this foreign, mysterious holiday. But when my friend told me that I must celebrate Day of the Dead in a tiny, mountainous town about an hour south of Mexico City, Tepoztlan, I was a bit confused. Tulum is not your average town. It has its own Mexican authenticity but unlike most towns, it is sprinkled with an exotic, foreign taste. Our first day in Mexico began in the tiny island of Isla Mujeres. The little town is filled with pastel colored homes and brightly painted murals around every corner. It is quaint yet bustling with the right kinds of people. Cabo San Lucas, Mexico is known for many things, including the ever eccentric Cabo-holics, spring break shenanigans, and luxurious resorts for those who enjoy a classier scene. Most of the time tourists end up eating resort food (which can be sub-par) or sticking to the main strip which, as flashy as it is, locals try and avoid because they know that the food is again sub-par and generally overpriced. There are, however, quite a few hidden gems in Cabo.